ArcoLinux, ArcoLinuxD and ArcoLinuxB is available for everyone for free. You can download it and make as many copies and installations you want. All you have to do is download the iso and burn it on a usb or dvd and boot from your media. We recommend you install ArcoLinux on an SSD as the only operating system. Installing ArcoLinux along side your existing operating system(s) is possible. You decide. If you have a slow connection, you can always choose a nearby server/mirror. 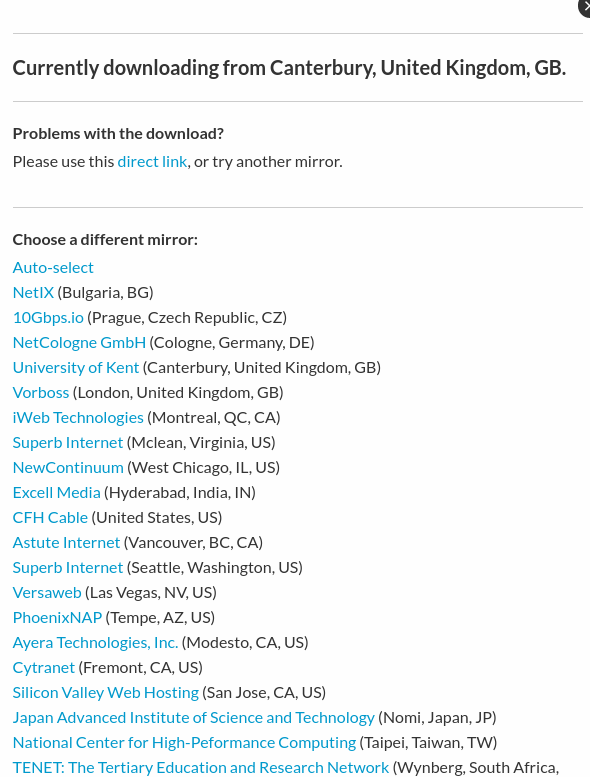 Then choose from what server you would like to download. The ArcoLinux Data server contains a file with all the md5sums of all the iso’s in the download folder. If you want to check if the download from SourceForge is not corrupted in any way then you can do so. Checking the integrity of the file is done for a couple of reasons. The first is that it guarantees that the file is not corrupt by checking it against the value of sourceforge. The second is that it guarantees the file to be authentic and has not been tampered with by unknown third parties. Performing the integrity check with md5sum or sha1sum is quite simple. Open a terminal or command prompt in the directory where the disk image is and type “md5sum” followed by the file name. Go to Sourceforge and press on the button behind the file with “i” or information to know the security checks of the file, you want to download. The numbers you have should match the ones on Sourceforge. We recommend you use an usb to install ArcoLinux. Simply because you can reuse it and it is a faster medium than a dvd. If you are on ArcoLinux you have already Mintstick installed. There is also Etcher that you can try out to burn an iso on Linux. On Windows we can recommend ETCHER. Follow the tutorial to see where to get Etcher, download and install it. Then we get the iso and show you how to burn it to a usb. You can also use UNetbootin as burner. This application will work on Linux, Windows. There is also Rufus you can try out. We recommend you use etcher on a mac. That is working perfectly.